SYSTEM 7 are playing a series of shows to promote the new album Café Seven. This album features contributions from both System 7 and their more ambient offshoot Mirror System. SYSTEM 7 take their audience on a journey, stretching dance music to the limits with a real depth and richness to their sound. Mirror System is their more ambient sister project, specializing in their chill-out and downtempo aspect. Café Seven, the brilliantly received new album, expertly mixes 5 tracks from Mirror System with 5 more-up tempo SYSTEM 7 tunes, evoking the blend of ambient and dancefloor beats of the early System 7 albums, with a bang up-to-date sound. Steve Hillage and Miquette Giraudy at their best, with guest collaborators Ajja and Marcus Henriksson. Upcoming shows this Autumn include Hebden Trades Club, five shows guesting with The Orb and a special show in London at Under The Bridge on 13th October. In 2019 we are taking booking for own shows and Festival events. 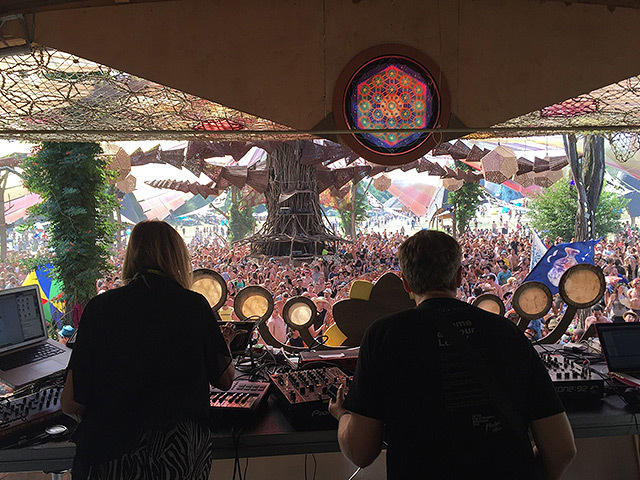 Notably System 7 are almost always re booked – they still hold the record for the most appearances for all time at the Dance stage at Glastonbury. Their uplifting live show has many fans and devotees and they continue to please and thrill audiences in equal measure.